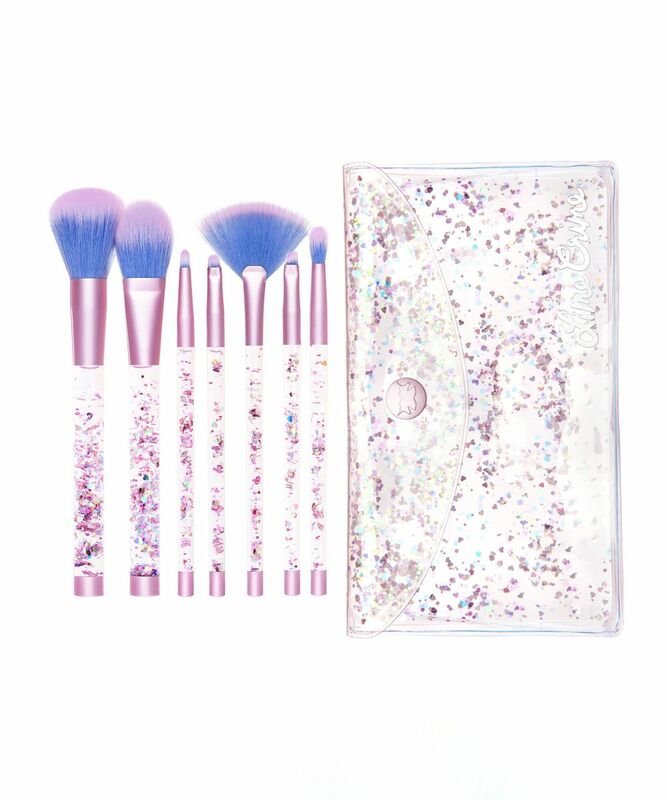 Gleaming, glittering and oh-so on-trend, this mermaid-inspired brush set will boost your make up kit with some much-needed sparkle and fun. Containing seven essential brushes – all made with super-soft, cruelty-free fibres – the kit will cover all your application needs, from eyeshadow to highlighter. Criminally cute and gorgeously glittering, Lime Crime’s Aquarium Brush Set is a must-have for magical make up application. Featuring seven essential brushes – all made with soft, cruelty-free fibres – this set contains all you need for flawless make up masterpieces. 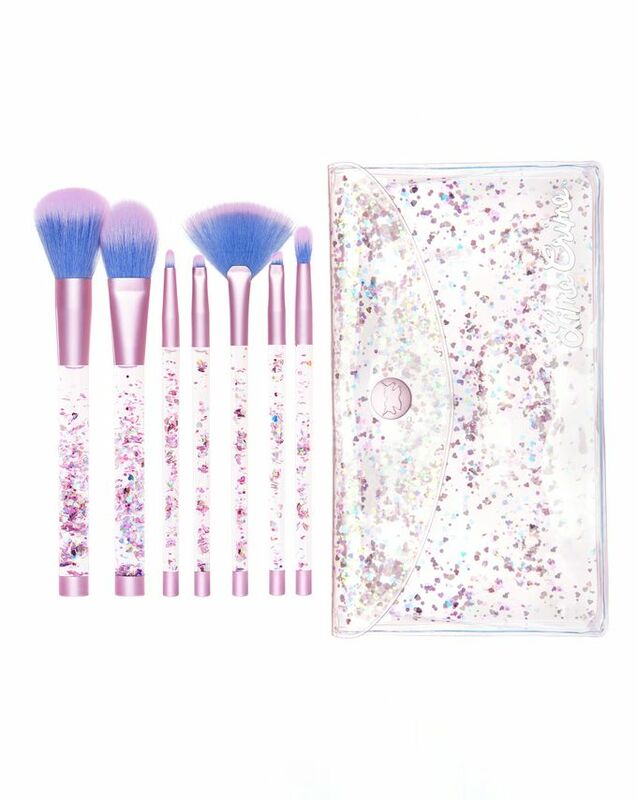 There are powder, blush, pencil, lip, fan, angled brow and shadow blender brushes, all with ombré purple heads and transparent handles filled with glittering water. 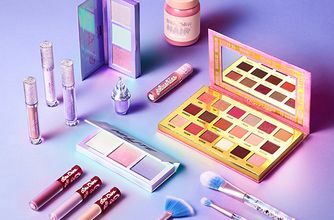 Housed in a dazzling pouch – which doubles up as a super-cute clutch – this collection makes the perfect addition to make up kits in need of a little boost. Powder brush: Use to apply loose and pressed powder. Blush brush: Use to gently sweep and blend powder blusher along the cheekbones and apples of the cheeks, blending in circular motions. Pencil brush: Use to emphasise every corner of your eye area. Lip brush: Use to precisely define your lip contour and apply lip products evenly on the entire lip. Fan brush: Use to apply highlighter to cheekbones, or to 'clean up' product fall out. Angled brow brush: Use this brush alone or with eyebrow powder in short, upward strokes following the natural line of the brow. Shadow blender brush: Use for blending shadow and buffing out the crease to create a flattering, ‘soft focus’ shadow-effect. The look of these brushes along with the purse is to die for, but the bristles do a pretty disappointing job of holding and distributing powder makeup, guess it's what comes with a pretty cheap price point. but the handles are sturdy and very very pretty. One of the brush broken, the density of bristles are not expected. For this price point, not worth. Do not buy. They're really nice brushes, I like the sparkles in the brushes and in the bag and they're from good quality. I love how they look and they're well made. Maybe not as dense as you'd want, but I enjoy them. My least favourite is the very tiny blender brush, but it's okay if you have tiny eyelids I guess.